This information sheet is written for Masters of seagoing vessels, shipping lines, agents, publishers of nautical information and any other party that needs nautical information. Associated Icelandic Ports, here after named Faxaports, makes every effort to make and maintain the contents of this document as up-to-date, accessible, error-free and complete as possible, but the correctness and completeness of these contents cannot be guaranteed. 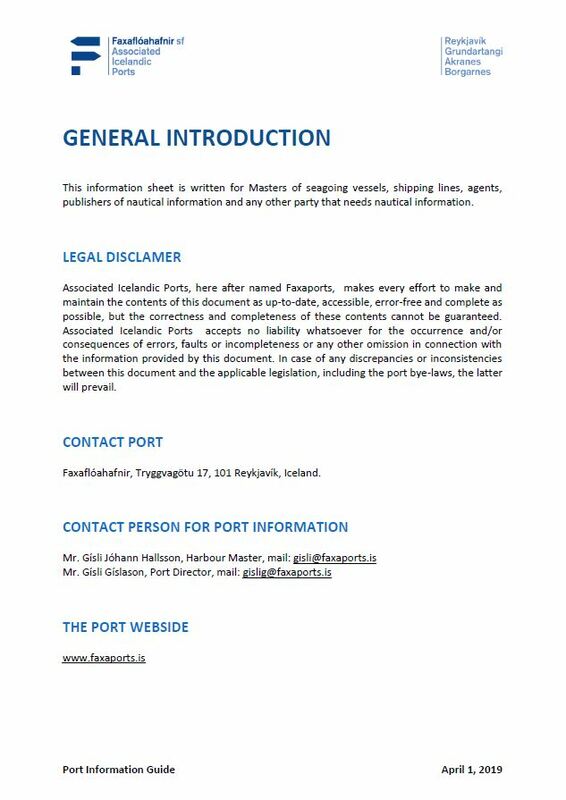 Associated Icelandic Ports accepts no liability whatsoever for the occurrence and/or consequences of errors, faults or incompleteness or any other omission in connection with the information provided by this document. In case of any discrepancies or inconsistencies between this document and the applicable legislation, including the port bye-laws, the latter will prevail. Faxaflóahafnir, Tryggvagötu 17, 101 Reykjavík, Iceland.